Singer Stefanie Lawrence specialises in a variety of styles. Pop, Rock, Soul, Funk and Jazz . All have influences on her sound. Stefanie is also part of the successful duo Ginny & the Tonic with the brilliant pianist Andrew Black. With her iPod favourites ranging from Prince and Billy Joel to Ella Fitzgerald and Ben Folds, you may not expect to hear this voice. Currently based in Glasgow, Stefanie is involved in various groups and original projects including The Gospel Truth Choir and Ginny & The Tonic. 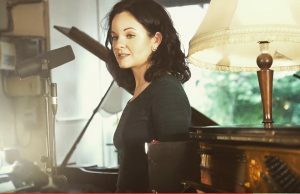 Tutored by Maureen McMullan (Berklee College of Music) and having received vocal guidance from Liane Carroll (Ronnie Scott’s Award and Double BBC Jazz award winner), Stefanie has worked with prestigious Jazz musicians including Mike Walker, Bobby Wellins and Scott Free. As a session vocalist and writer, Stefanie is no stranger to large audiences. She has performed around the world with shows in San Francisco, Orlando and Nashville, to London, Russia and Shanghai, as well as appearances at Glasgow’s International Jazz Festival. “Stef is a great singer. she has a real passion in her voice and she know how to take a song and make it hers. She is also someone who comes alive when she performs and that makes her very special.” Ricky Ross, Deacon Blue.